Not really. I personally couldn’t live without cheese, or milk, or meat for that matter. Saying that, I’ve always wondered about vegan baking, the taste, the look, how it would come together and would I be able to tell the difference. When I saw this cake on Joy the Baker I was amazed, obsessed even. I couldn’t stop thinking about the unusual ingredients, the amazing colour of the frosting, how it would taste. In the end it all became too much, I had to make this cake. Although Joy’s cake looked utterly fantastic, I didn’t have high hopes for mine. I envisioned two rock hard discus’ emerging from my oven, smoldering gently. I thought if I kept my thoughts low I couldn’t be disappointed when I inevitably fail. Well, I didn’t fail (or I did a little, we’ll get to that later) the cakes came out better than most of my normal chocolate cakes. So tall, so chocolatey, so beautiful. I stood looking at them, cooling on the windowsill with love in my eyes. I was so proud. 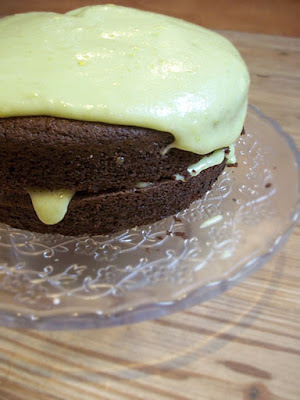 Next came the frosting, with just avocado, icing sugar and lemon juice I was dubious. On its own it tastes a little odd but as Joy stated, once paired with the cake it will blow you away. It really is important to use the ripest avocados you can get, mine were still a little hard so rather than attempting to mash them I threw the flesh into my blender and hit puree. Sorted! My failure came when constructing the cake. Due to me over handling one half while still warm, it developed a small crack. No biggie I thought, it’ll be fine. Well, once frosted the tiny crack turned into the grand canyon, half of the top layer cascading off the waterfall of beautiful green filling. I fought back the tears, struggling manically to piece the sticky chunks back together. Never use a cracked cake as the top layer, I learned the hard way! While the cake was good, it wasn’t good enough for me to be forever converted to the vegan cake. It was kind of like a chocolate carrot cake in texture. Yummy, but not super duper yummy 😉 My search continues. I enjoyed this post; the title was a real "gotcha" – you had me fooled! I"m glad somebody made this and reported back. So Joy wasn't exaggerating? Good to know. This cake would have been better with a slab of pork in the middle.I jest. You know that I'm purposely trying to rid the world of vegans. I see myself as the wifey from Touched By An Angel; I come into the confused vegan's life and show them the way, via a heavily buttered cheese scone.However, this cake has me curious….it looks so moist and tasty!It reminds me of the chocolate and beetroot one at the market. Nom. I'd still have to drink a pint of milk afterwards to make me feel better. Possibly out of a tankard covered in leather.